Reduce spasticity that interferes with motor function in children with spastic Cerebral Palsy. The SDR procedure is not currently available on the NHS as funding for the surgery has been withdrawn whilst NHS England examines its effectiveness via a process called Commissioning Through Evaluation. There are 7 funded centres: Alder Hey Children’s NHS Foundation Trust; The Portland Hospital for Women and Children; Great Ormond Street Hospitals NHS Foundation Trust; Leeds Teaching Hospitals NHS Trust; Nottingham University Hospitals NHS Trust; University Hospitals Bristol NHS Foundation Trust; The Robert Jones and Agnes Hunt Orthopaedic Hospital NHS. They undertake approximately 120 SDR cases a year with selected children to gather detailed information about clinical outcomes to produce a final report in Autumn 2018. Despite this SDR can be self-funded in the UK through the NHS hospital treatment top-up scheme. In the UK the procedure costs between £30,000- £40,000. Two groups of nerve roots leave the spinal cord through the intervertebral foramen: the ventral and dorsal spinal roots . The ventral nerve roots are efferent motor roots and are responsible for control of muscular contractions, hormone synthesis and gland secretion. The dorsal nerve roots are afferent sensory roots and are responsible for the transmission of sensory stimulation to the CNS . The SDR procedure decreases sensory stimulation to the CNS by dividing the dorsal nerve roots whilst preserving voluntary movement . The operation takes place under general anaesthetic and lasts approximately 5 hours. The procedure involves dividing some of the lumbar sensory nerve roots in order to reduce the sensory input to the sensory–motor reflex arcs which are responsible for increased muscle tone. A laminectomy of one or more vertebrae from L1 to S1 vertebrae is performed to expose the dural sac , which is opened to display the spinal conus with or without the cauda equina. The sensory nerve roots are identified intraoperatively using electrical stimulation, those that generate unusual electrical activity are thought to be those which contribute to spasticity. The selected sensory rootlets are divided, preserving some sensory supply and the motor roots responsible for voluntary movements. Up to 50% of the sensory nerve at each level is divided. SDR is common in North America however there are significant variations between centers in the way the procedure is carried out. For a descriptive video of the procedure follow this link to Dr. Samuel Brown discussing Selective Dorsal Rhizotomy . Advantages and Disadvantages of the different surgical approaches for SDR . Functional outcomes at one-year follow-up are similar with both surgical methods . SDR has been shown to be a safe and effective to reduce spasticity of children in all Gross Motor Function Classification System Levels (GMFCS) with the benefits lasting into adolescence and adulthood. SDR is a high-risk surgery and the procedure is irreversible. Patients may experience deterioration in walking ability, numbness and bladder dysfunction following the operation and later complications including spinal deformity and hip dislocation. Scoliosis is generally associated with the traditional multi-level laminectomy technique which exposes about 3 inches of the lower spine. Other suggested adverse events include death, worsening motor function and/or paraplegia, infection of the surgical wound, meningitis, cerebrospinal fluid leakage, constipation, weakness, chronic pain, and late arachnoiditis and/or syringomyelia . CP is a condition that encompasses brain disorders that originate in early childhood or during foetal stages of development. Abnormalities in balance, posture, movement, language and vision are common. These variants can lead to a reduced level of function in activities such as walking and sitting, often with increased levels of discomfort. 80% of CP patients experience lower limb spasticity. Spasticity develops when an imbalance occurs in the excitatory and inhibitory input to α motor neurons which is caused by damage to the spinal cord and/or central nervous system. This damage then results in an imbalance between messages from the nervous system to the muscles causing increased excitability . Care must be taken when carrying out treatments to reduce spasticity such as SDR as some children can rely on their increased tone functionally compensate for their underlying weakness and therefore strategies to improve strength are incredibly important. 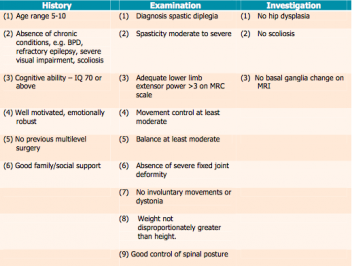 Generally patients treated with SDR have bilateral lower limb spasticity and GMFCS level I – II . For a patient to be considered the spasticity should have a negative impact on gross motor function and caregiver support. 10 year follow up studies have shown that children with a GMFCS level of I – II show greater improvement than patients at level IV or V .
Spastic: bilateral lower limb spasticity leading to reduced functionality. Strength: adequate lower limb muscle strength and control. Straight: adequate trunk and head control without fixed orthopaedic deformity. Smart: not having cognitive defects. Spasticity should be measured using the Ashworth Scale, Duncan-Ely Test, quality of deep tendon reflexes and the presence or absence of sustained clonus. In terms of strength it is thought that for patients to respond and be considered for SDR they should have mild weakness in their lower limbs, or the equivalent to a grade 4 on the MRC scale. Alternatively below is a grid from Robert Jones and Agnes Hunt Orthopaedic and District , this explains their selection criteria and is applicable to the UK hospital setting. Family support and ability to collaborate in rehabilitation is also vital, as without this the patient will not be able to engage with the intensive physiotherapy post-surgery to gain optimal improvement. It is also important that all members of the MDT and family agree on the decision to undergo SDR and understand the individual treatment goals . Absence of good antigravity muscles. Absence of good motor control. Presence of spina abnormalities/severe scoliosis. Currently the issue with the selection criteria for patient who are suitable for SDR is that there isn’t any consistency, which means that the process is not validated or reproducible . and assessments of disability, social inclusion, and quality of life. Previously, long-term functional outcomes, safety and side effects have been measured 5 years post SDR. 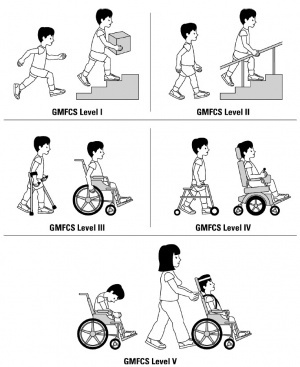 The Gross Motor Function Classification System (GMFCS) levels III–V were used to quantify these outcomes. It found that there was a reduce in muscle tone of the hip abductors, hamstrings and dorsiflexors with increased PROM in hip abduction, popliteal angle and ankle dorsiflexion. This showed that SDR provides lasting functional benefits over a period of at least five years postoperatively. Selective Dorsal Rhizotomy is a multidisciplinary intervention that requires cooperation and communication between many different professionals. Medical management for cerebral palsy aim to improve function by managing spasticity but also encompassess treatment of the multiple associated co-morbidities including; visual and hearing impairment, constipation, epilepsy,gastro-oesophageal reflux and learning and behavioural difficulties. Orthoses such as AFO’s are useful to help improve motor control, these can be assessed for by physiotherapists, occupational therapists and orthotists. In addition, second skin garments such as lycra suits can be used in the management of dystonia and can help to improve proximal stability due to the close-fitting nature and elastic properties of the Lycra. Unconventional therapies including hippotherapy, hyperbaric oxygen, and acupuncture have been shown to show improvements for quality of life although functional benefits are debated. Early mobilisation should aim to maintain and improve range of motion, whilst also ensuring adequate positioning of lower limbs, including supine, prone and sitting with the lower limbs extended . Muscles targeted by strengthening exercises are as follows: hip extensors and abductors, knee extensors, dorsiflexors . Gait training should begin in the second week post operation, and focus on facilitation of a normal gait pattern . Rehabilitation should also include fine motor training, functional activities to aid with ADL's, and posture control . Postural transfer training in sitting, kneeling, crawling, standing from floor and chair is also crucial for increasing functionality . Following discharge from the acute setting patients are referred to local physiotherapists. During the first six weeks the therapist should continue to assess risk and advise on mobility aids and equipment . This particularly important for children who previously used their spasticity to increase their spasticity to increase their functionality. 3 to 6 months following surgery it is important to provide progressive rehabilitation that includes muscle control, graded resistance training, fitness and endurance. The optimal dosage of this is not known from the current evidence base, however it is important to include repetitive guided practice with a motivational goal. Strict use of selection criteria for SDR helps to significantly improve and optimise outcomes including walking speed, range of motion and strength. Intensive physiotherapy is essential following SDR to manage spasticity in patients with Cerebral Palsy and is determinant of successful outcomes . Protocols vary but generally consist of similar principles to increase independence and function. ↑ 1.0 1.1 Verity, C. (2017). Selective Dorsal Rhizotomy (SDR) | Disability charity Scope UK. [online] Available at: https://www.scope.org.uk/support/therapies/selective-dorsal-rhizotomy [Accessed 20 May 2018]. ↑ 2.0 2.1 Nordmark, E., Josenby, A., Lagergren, J., Andersson, G., Strömblad, L. and Westbom, L. (2008). Long-term outcomes five years after selective dorsal rhizotomy. BMC Pediatrics, 8(1). ↑ Scope UK. (2018). Selective Dorsal Rhizotomy (SDR) | Disability charity Scope UK. [online] Available at: https://www.scope.org.uk/support/therapies/selective-dorsal-rhizotomy [Accessed 22 May 2018]. ↑ NHS England. (2014). NHS England » NHS England funds the evaluation of specialist surgery for more than 100 children a year with cerebral palsy. [online] England.nhs.uk. Available at: https://www.england.nhs.uk/2014/07/cte-specialist-surgery/ [Accessed 20 May 2018]. ↑ The Portland Hospital (2015). The Portland Hospital – the first private hospital in the UK to perform the Selective Dorsal Rhizotomy procedure | News | The Portland Hospital. [online] Available at: http://www.theportlandhospital.com/news/the-portland-hospital-the-first-private-hospital-in-the-uk-to-perform-the-selective-dorsal-rhizotomy-procedure/ [Accessed 22 May 2018]. ↑ St. Louis Children's Hospital (2018). Selective Dorsal Rhizotomy. [image] Available at: http://www.stlouischildrens.org/our-services/center-cerebral-palsy-spasticity/about-selective-dorsal-rhizotomy-sdr [Accessed 21 May 2018]. ↑ Laser Spine Institute (n.d.). Guide to a Ventral Nerve Root. [online] Laser Spine Institute. Available at: https://www.laserspineinstitute.com/back_problems/spinal_anatomy/spinal_cord/ventral_root/ [Accessed 21 May 2018]. ↑ NHS England. (2013). Clinical Commissioning Policy Statement : Selective Dorsal Rhizotomy (SDR) [online] Available at: https://www.england.nhs.uk/commissioning/wp-content/uploads/sites/12/2013/04/e09-ps-a.pdf [Accessed 21 May 2018]. ↑ NICE (2006). Interventional procedure overview of selective dorsal rhizotomy for spasticity in cerebral palsy | NICE. [online]Available at: https://www.nice.org.uk/guidance/ipg373/evidence/overview-pdf-316141021 [Accessed 20 May 2018]. ↑ Funk, J. and Haberl, H. (2016). Monosegmental laminoplasty for selective dorsal rhizotomy—operative technique and influence on the development of scoliosis in ambulatory children with cerebral palsy. Child's Nervous System, 32(5), pp.819-825. ↑ 11.0 11.1 11.2 11.3 11.4 11.5 NICE (2010). Selective dorsal rhizotomy for spasticity in cerebral palsy | Guidance and guidelines | NICE. [online] Available at: https://www.nice.org.uk/guidance/ipg373/chapter/2-The-procedure#outline-of-the-procedure [Accessed 17 May 2018]. ↑ 13.0 13.1 Steinbok, P. (2007). Selective dorsal rhizotomy for spastic cerebral palsy: a review. Child's Nervous System, 23(9), pp.981-990. ↑ Seattle Children's SDR channel (2017). Dr. Samuel Browd discusses Selective Dorsal Rhizotomy (SDR). [video] Available at: https://www.youtube.com/watch?v=HFad8MiTK_g [Accessed 21 May 2018]. ↑ 16.0 16.1 Ou, C., Kent, S., Miller, S. and Steinbok, P. (2010). Selective dorsal rhizotomy in children: comparison of outcomes after single-level versus multi-level laminectomy technique. Canadian Journal of Neuroscience nursing, 32(3), pp.17-24. ↑ Dudley, R., Parolin, M., Gagnon, B., Saluja, R., Yap, R., Montpetit, K., Ruck, J., Poulin, C., Cantin, M., Benaroch, T. and Farmer, J. (2013). Long-term functional benefits of selective dorsal rhizotomy for spastic cerebral palsy. Journal of Neurosurgery: Pediatrics, 12(2), pp.142-150. ↑ Ailon, T., Beauchamp, R., Miller, S., Mortenson, P., Kerr, J., Hengel, A. and Steinbok, P. (2015). Long-term outcome after selective dorsal rhizotomy in children with spastic cerebral palsy. Child's Nervous System, 31(3), pp.415-423. ↑ Physiopedia. (2018). Spasticity. [online] Available at: https://www.physio-pedia.com/Spasticity [Accessed 26 May 2018]. ↑ 21.0 21.1 21.2 21.3 Smith, M. and Kurian, M. (2012). The medical management of cerebral palsy. Paediatrics and Child Health, 22(9), pp.372-376. ↑ 22.0 22.1 22.2 22.3 22.4 22.5 Grunt, S., Fieggen, A. G., Vermeulen, R. J., Becher Jules, G. & Langerak Nelleke, G. (2013) Selection criteria for selective dorsal rhizotomy in children with spastic cerebral palsy: a systematic review of the literature. Developmental Medicine & Child Neurology, 56(4), 302-312. ↑ 23.0 23.1 23.2 23.3 23.4 23.5 23.6 23.7 Nicolini-Panisson, R. D. A., Tedesco, A. P., Folle, M. R. & Donadio, M. V. F. (2018) Selective Dorsal Rhizotomy in Cerebral Palsy: Selection Criteria and Postoperative Physical Therapy Protocols. Revista Paulista de Pediatria, 36(1), 100-108. ↑ NICE (2018). Selective dorsal rhizotomy for spasticity in cerebral palsy | Guidance and guidelines | NICE. [online] Nice.org.uk. Available at: https://www.nice.org.uk/guidance/ipg373/chapter/1-Guidance [Accessed 26 May 2018]. ↑ Nordmark, E., Josenby, A., Lagergren, J., Andersson, G., Strömblad, L. and Westbom, L. (2008). Long-term outcomes five years after selective dorsal rhizotomy. BMC Pediatrics, 8(1). ↑ Calgary Paeds (2018). Gross Motor Function Classification System. [image] Available at: https://calgarypaeds.org/?page_id=3773 [Accessed 28 May 2018]. ↑ Coghill, J. and Simkiss, D. (2010). Do lycra garments improve function and movement in children with cerebral palsy?. Archives of Disease in Childhood, 95(5), pp.393-395. ↑ Steinbok, P. and McLeod, K. (2002). Comparison of Motor Outcomes after Selective Dorsal Rhizotomy with and without Preoperative Intensified Physiotherapy in Children with Spastic Diplegic Cerebral Palsy. Pediatric Neurosurgery, 36(3), pp.142-147. ↑ 31.0 31.1 31.2 31.3 Cawker, S. and Aquilina, K. (2016). Selective dorsal rhizotomy (the perspective of the neurosurgeon and physiotherapist). Paediatrics and Child Health, 26(9), pp.395-399. ↑ Leeds neurosurgery (2013). Selective Dorsal Rhizotomy - Information for physiotherapists. [online] Available at: http://www.leedsneurosurgery.com/patients/dorsal_rhizotomy/SDR%20post%20op%20info%20for%20PT.pdf [Accessed 28 May 2018]. ↑ Physio for Children, Bristol. (2018). Physio for Children, Bristol. [online] Available at: https://www.physioforchildren.com/sdr-and-physio [Accessed 28 May 2018]. ↑ Nicolini‐Panisson, R., Tedesco, A., Folle, M. and Fagundes Donadio, M. (2017). What do we know about physical therapy post selective dorsal rhizotomy?. Developmental Medicine & Child Neurology, 59, pp.19-19. ↑ Cole, G., Farmer, S., Roberts, A., Stewart, C. and Patrick, J. (2007). Selective dorsal rhizotomy for children with cerebral palsy: the Oswestry experience. Archives of Disease in Childhood, 92(9), pp.781-785.